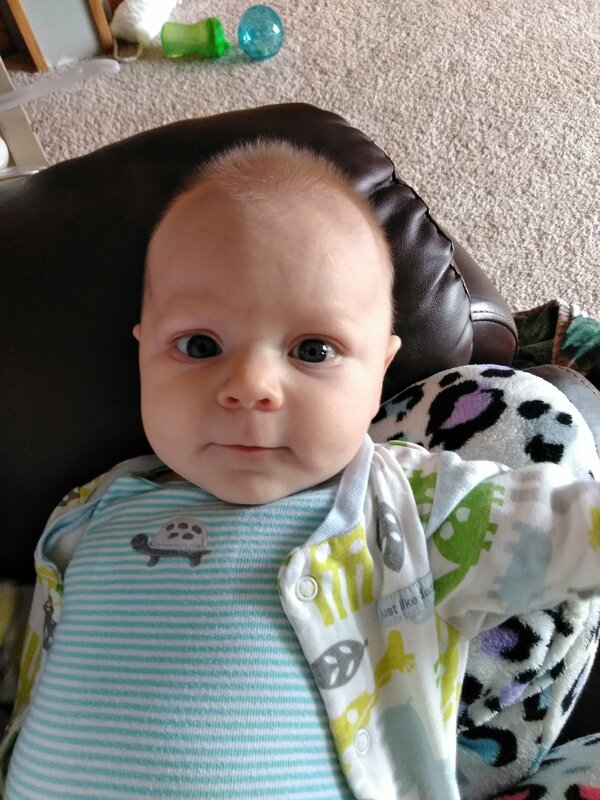 Last week (13 weeks) Zane had a cold. It had started the week before and I’d wrote about it in his 12 week update. It ended up getting really bad with the congestion and cough. 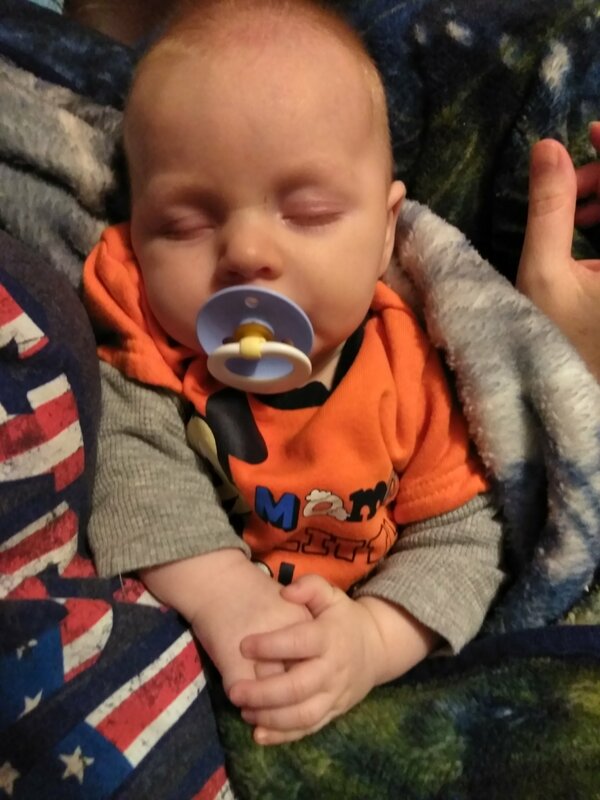 We had one really rough night where I tried holding him upright in the recliner so he could get some sleep. He was struggling to breathe so much and it was really scary to me to see how distressed he was about it. Of course I suctioned his nose but it didn’t help much. The cough was wet and rattly and he would vomit mucus from time to time from all the drainage. I really didn’t want to take him to the dr because A) They can’t do much for colds anyway and B) GERMS! I figured if he was struggling this much with a cold, we don’t even want to think about the flu! Plus he didn’t ever get a fever, thank God. It took about 9 days to clear up, which I guess is normal, and I am happy to say that he is back to feeling more himself. I caught the cold but it was just a sore throat and a little drainage for me. Everyone else stayed well and hopefully will continue to be well. This flu season has had me on edge for months! I can’t get over how grown up Zane is acting. He is developing such a personality! 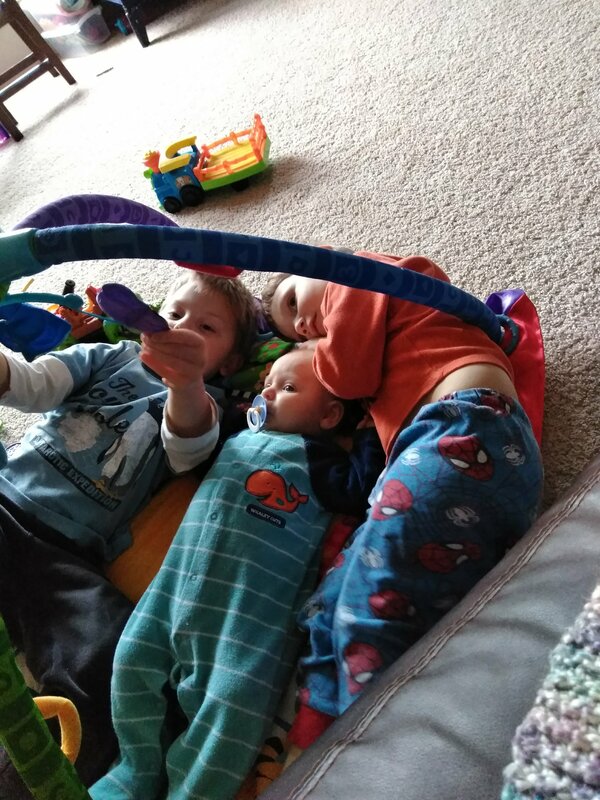 He is already so vocal about wanting his big brothers to play with him. He watches them all the time and fusses if they don’t come talk to him. 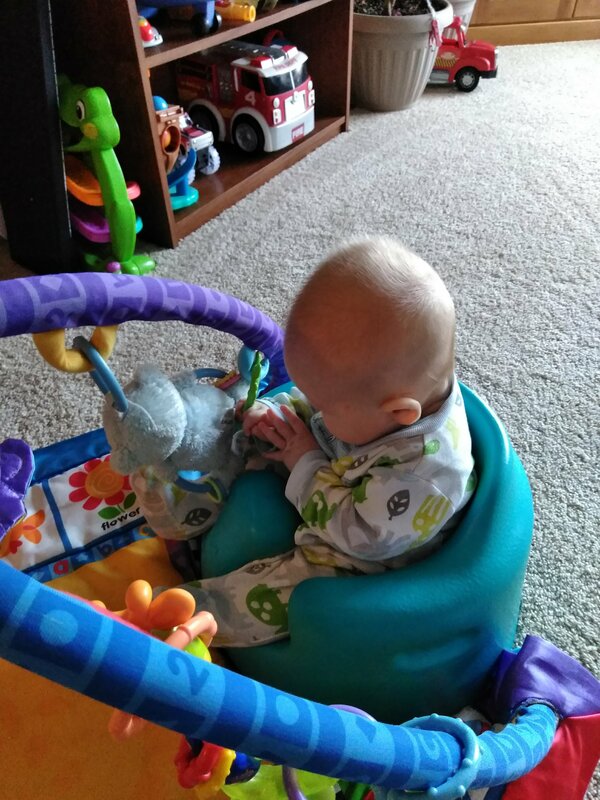 He likes to lay on his play mat with them and when they walk away, he fusses and when they come back he is all smiles and coos again. It’s so funny! Zane is super *talkative* and absolutely loves to have little conversations. In fact, we all talk to him all day and he answers back with lots of smiles, laughs and coos. He is very expressive with his eyebrows and it is positively hilarious to watch his face while he tries to figure stuff out. The older Zane gets the more he looks like Truett. Seriously, sometimes I feel like I have Tru as a baby all over again. It’s crazy! They have the same eyes and mouth although Zane’s hair is a bit darker I think and his nose is more like Levi’s. But his personality is all his own! 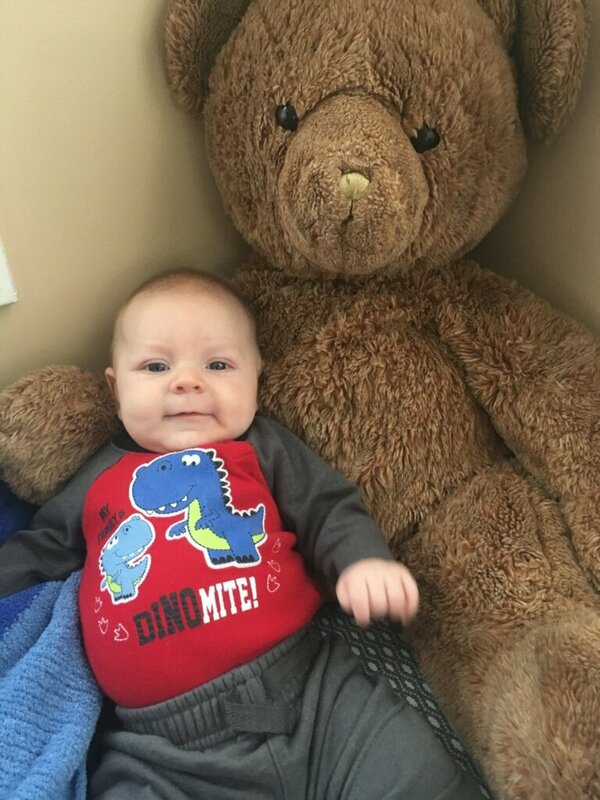 It’s amazing how different each person is, even as an infant. We finally made it all the way through the night again sleeping last night. 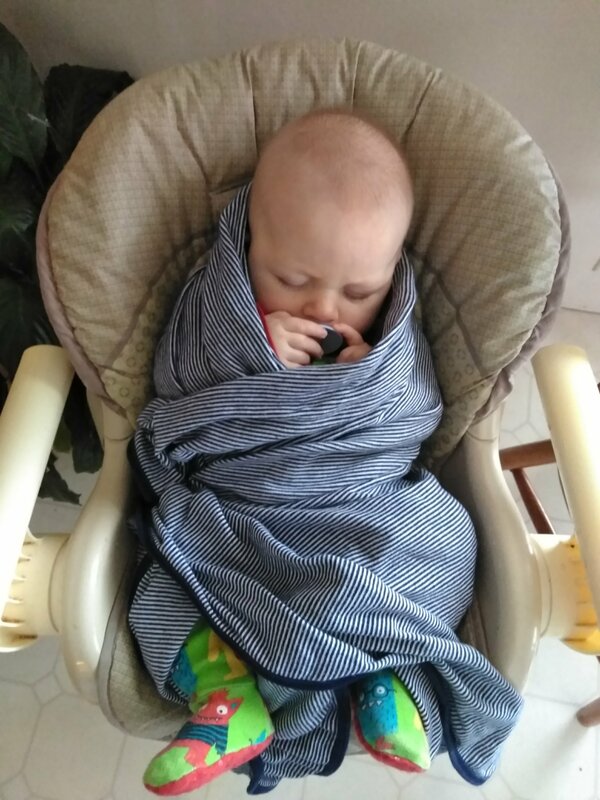 Zane had been waking up at least once or twice at night to eat while he was sick. I think it mostly was to wash all the mucous out of his throat so he could breathe better. I can’t complain about getting up once or twice but I am thrilled that he is happy to sleep through again. (Especially since Levi is waking up all night and coming into our bed multiple times. He says he’s scared. 😦 Poor thing.) Naps are still usually frequent and relatively short with maybe one longer nap a day. 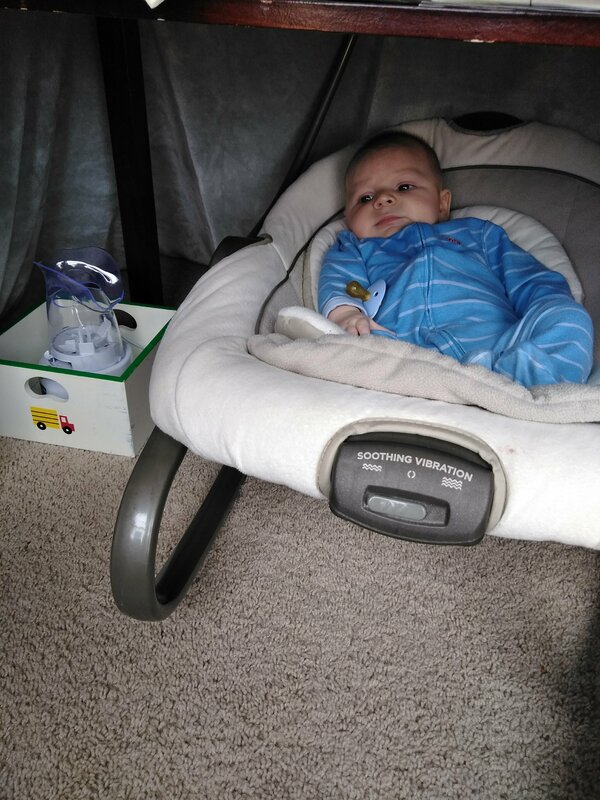 He just started taking more of his naps in his swing or laying down now. I think he has a hard time sleeping on my chest as much since I don’t sit still enough or be quiet enough. It’s a good thing/bad thing. 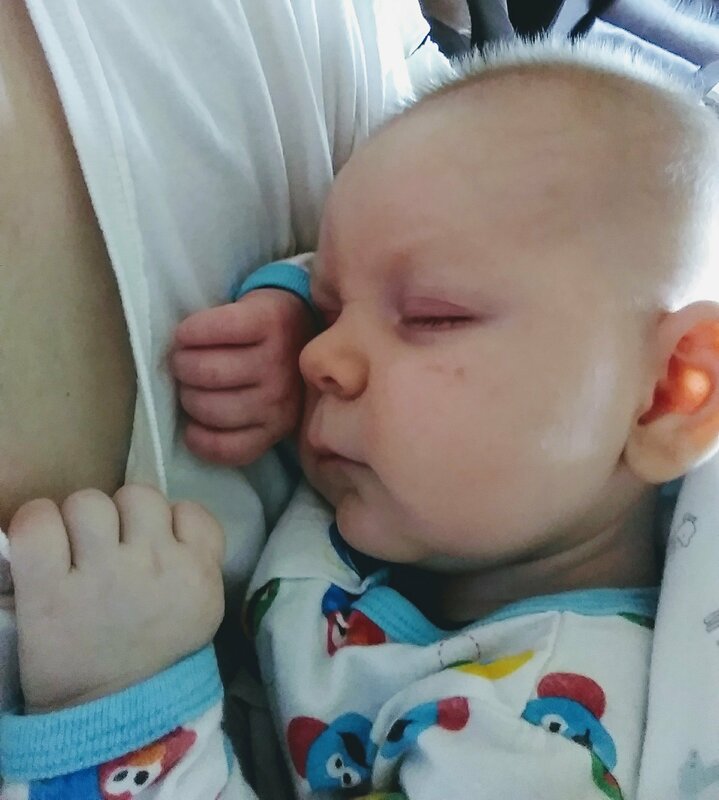 I love holding him while he sleeps all the time but also I have more time to get things done and it’s time for him to start learning to take naps on his own soon anyway. And, I guess there isn’t much more to say at the moment. As for myself, I have used my elliptical 5 days in a row. I am really hoping I don’t lose my momentum because exercise is making me feel great! I usually do a 37 minute program and then jump in the shower. It is about exactly as much time as the kids will behave for before they start destroying the house. 😉 I try to cram it all in during one of Zane’s naps, although he usually wakes up halfway through and just watches me with a very confused look on his face. Haha! 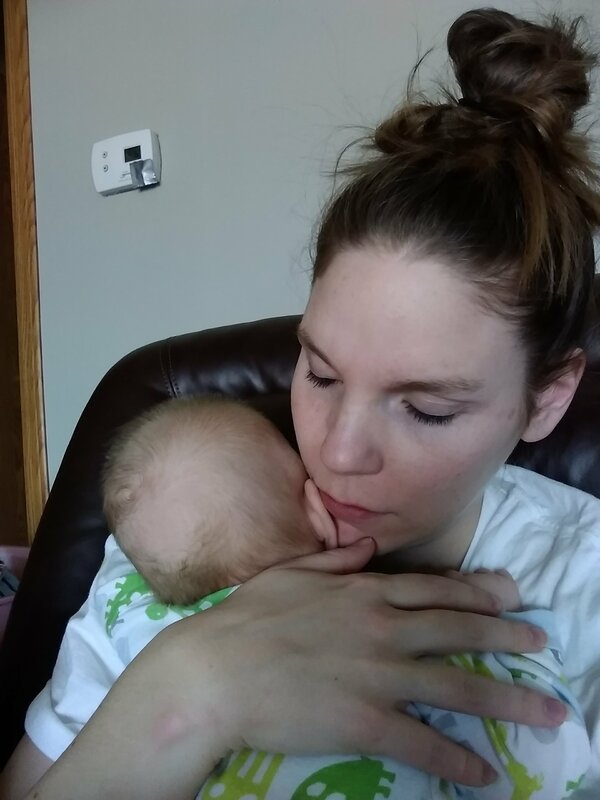 I’ve been feeling a bit of the postpartum anxiety I remember so well from after I had Tru and I know that exercise is extremely important for my health, mental and physical. I am truly looking forward to consistent warm weather and the end of this nightmare flu season so we can get out of the house and do things again! I haven’t taken the kids in any stores in probably 3 weeks now. We have only gone to relatives houses and church. It’s getting lonely being so secluded. Oh well. It’s only a season. Literally. Dear God, thank You for a much better week with Zane feeling better again. 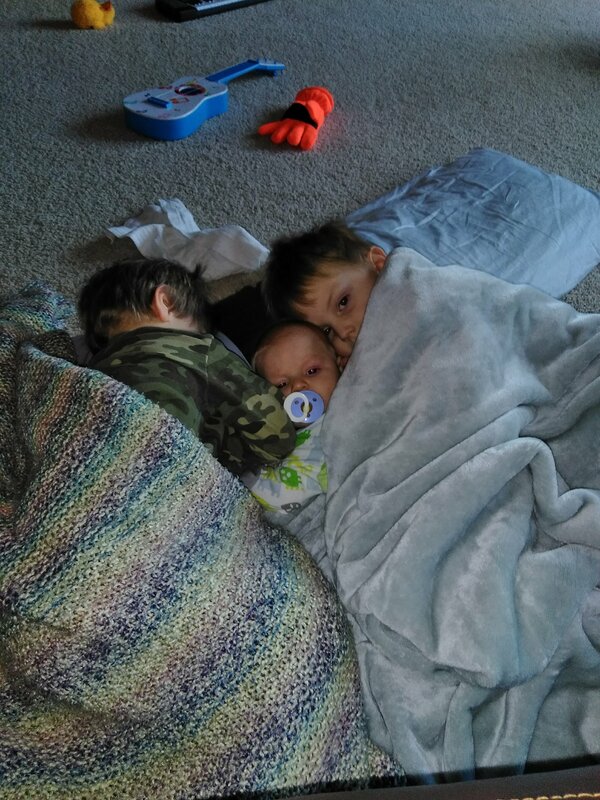 Thank You for helping him get well from his cold. Please help us and everyone to stay well throughout the rest of flu season. Thank You for the warmer days this week and for all the fun we have had spending time together. In Jesus’ name, amen. In a little “steam tent” to help unclog his nose. 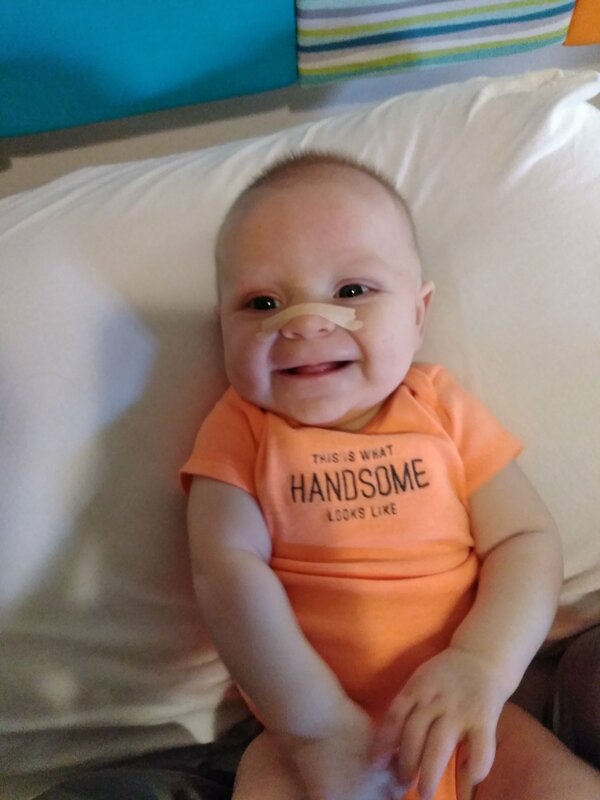 A much happier baby after I cut a nasal strip in half and used on his nose. They help so much guys!! 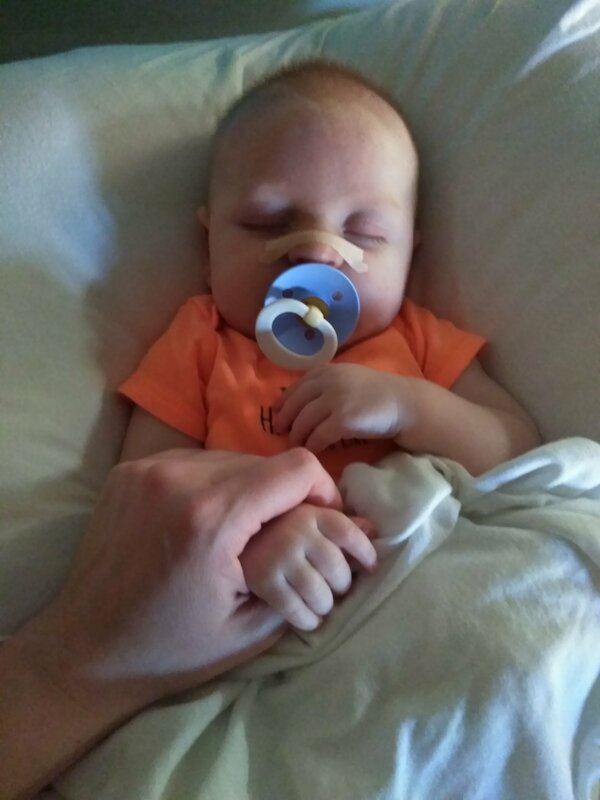 Fell asleep holding my hand. So precious! He’s actually holding toys now! Tru spends so much time entertaining Zane and playing with him. They love holding each other’s hands. I wrote a post about a E.P.T. 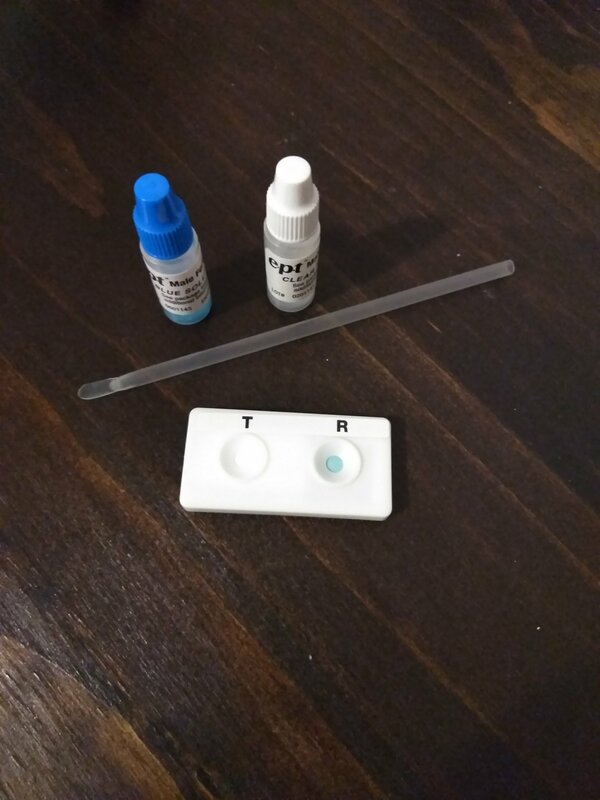 male fertility test I bought. You can click on the link above and read it if you don’t remember. This post will make a lot more sense if you read that first. I’ve had that test tucked away for over 2 years now, and to be honest, it is expired. But I should think it’s probably still accurate. It’s not as though a test sealed in a foil pouch knows the exact day to expire, but nonetheless, I’ll go ahead and put that disclaimer out there. Ok, so we finally decided to do the test. Obviously we have gotten pregnant multiple times, praise God, so regardless of what the test said, we know that God has either worked a miracle of healing in DH or has chosen to give us babies regardless of the sperm count, morphology etc. It appears that the later is the case! 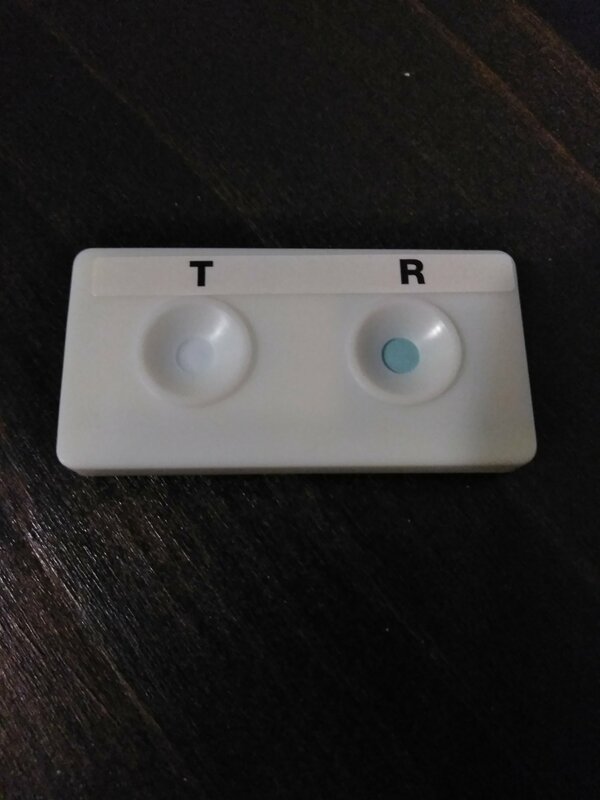 The test well is supposed to turn blue equal or greater to the reference well if the sperm count is equal or greater than 20mil/ml. A lighter blue or white indicates a lower sperm count. The test does not measure morphology or motility, etc. DH’s test came back stark white. Not even a hint of blue! He’s still clinically infertile if this test is right, and I’m sure it is, yet God has done miraculous things by giving us these beautiful boys. Regardless of how they came to be, they are all miracles and precious gifts. I am so very thankful for them and I just praise God for the amazing blessings he has given us. Zane usually wakes up for the day around 10:30am now. It was 9 – 9:30 when he was sleeping though the night and then getting up for the day, which he did for several weeks. But the last week or two he’s been waking around 7am or so to nurse and then going back to sleep for a few hours. I guess he needs his beauty sleep and, let me just say, he is beautiful so it must be working. 🙂 When he wakes up for the day, he is all smiles. 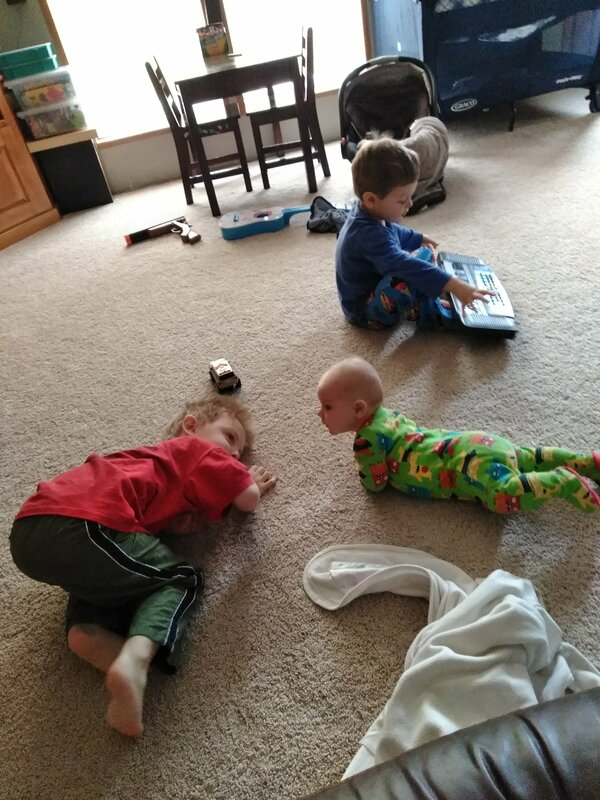 I bring him to the family room and he lays on the floor and stretches and coos at his big brothers for about a half hour. I usually pump during this time while I watch them all interact. Then I get Zane out of his sleep sack that Tru usually unzips (for some reason this is his job, haha) and change his diaper and nurse him. Sometime after that Zane takes a short nap, preferably on my chest. When he wakes up he smiles and we have little conversations and we repeat this cycle all day until evening. 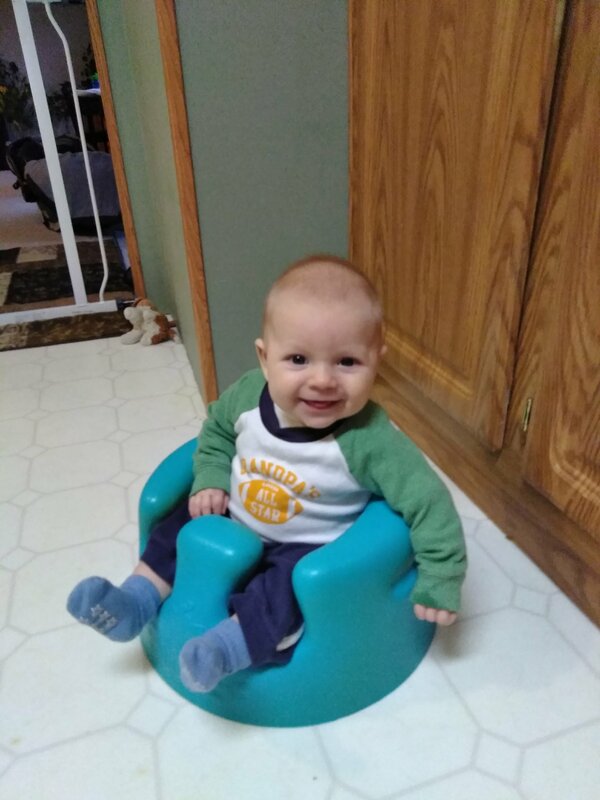 In the evening, DH and I take turns holding Zane and sometimes he will sit in his swing or seat during supper. He’s usually pretty alert during the evening until the boys go to bed and then he naps. A lot of the time DH also naps and I take pics of them snuggling and napping on the couch. Then it’s bedtime! 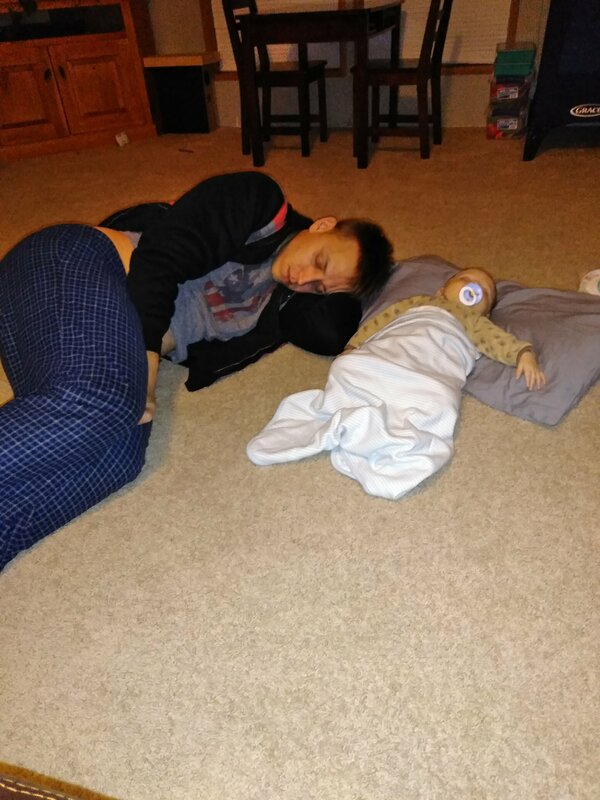 I usually lay Zane down for the night after I nurse him around 11pm. That’s pretty much our day in a nutshell! Zane likes to be held but will tolerate being put down for short periods of maybe 10-15 minutes here and there and then he gets antsy, so I pick him back up. He’s somewhere between Tru and Levi’s extremes. Tru didn’t like being held very much at all and Levi wanted to be held constantly. Zane likes to go back and forth all day. I don’t mind though. I am glad he’s cuddly. I love that he holds onto my arm when I have him on my chest! 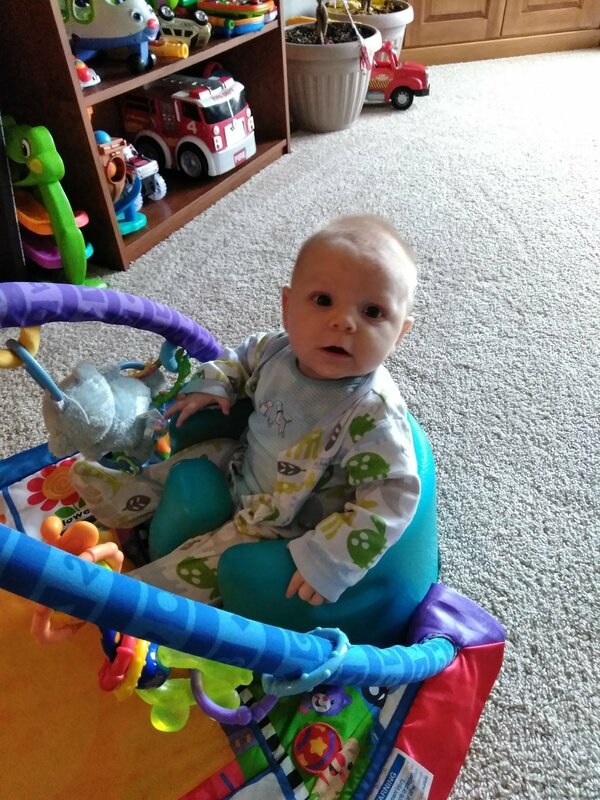 He will usually take at least one of his longer naps in his swing or play pen in the living room. His swing detaches and becomes a seat, so I try to take advantage of that and carry him into the bathroom while I take my shower. Sometimes I can fit my shower in while Tru and Levi have nap/quiet time but I like to shower earlier if possible so most days they are all 3 sitting in the bathroom while I lather, rinse and definitely don’t repeat, real quick! 😉 Haha. 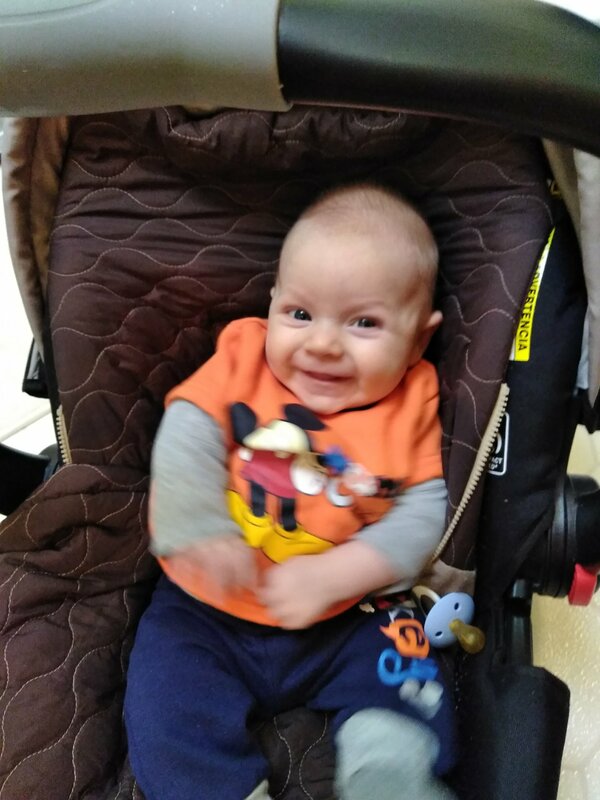 I can still say that Zane is the happiest, smiliest baby I have ever seen. I am not even sorry to brag about it. I have learned how tough toddlerhood can be so I’ll enjoy it while I can! Honestly though, I have had times where I have just sat there and thought “How many days has it been since he last cried?!! ?” I mean, sure, he fusses. But full-on crying, hardly ever. And I’m not trying to make anyone feel bad who has a fussy baby, I just want to write this down for my own sake to look back on later. ….. However, he is fussier today due to being congested or something. He woke up this morning with a rattly cough and is very hoarse now. With all the sickness happening this winter, I am so concerned but hopefully it’s just a minor cold. Although I don’t see HOW since he hasn’t been anywhere at all since last Sunday and it’s now Friday. We drove to the vet but I left him in the car with my sister who was not sick, then we drove to the store but we stayed in the car again. Today we went to my parent’s house for a bit. Otherwise, we have been homebodies most of the winter. I am so looking forward to warmer weather!!! Zane is still taking Zantac for acid reflux but he is doing much better. I think I forgot to give it to him last night though and that might be why he has so much chest rattling today… I don’t know. He is so close to rolling over, back to front. He gets almost halfway over and then stops. He can turn himself around while laying on the floor on his back. He makes a semi circle usually. I think Zane is teething. 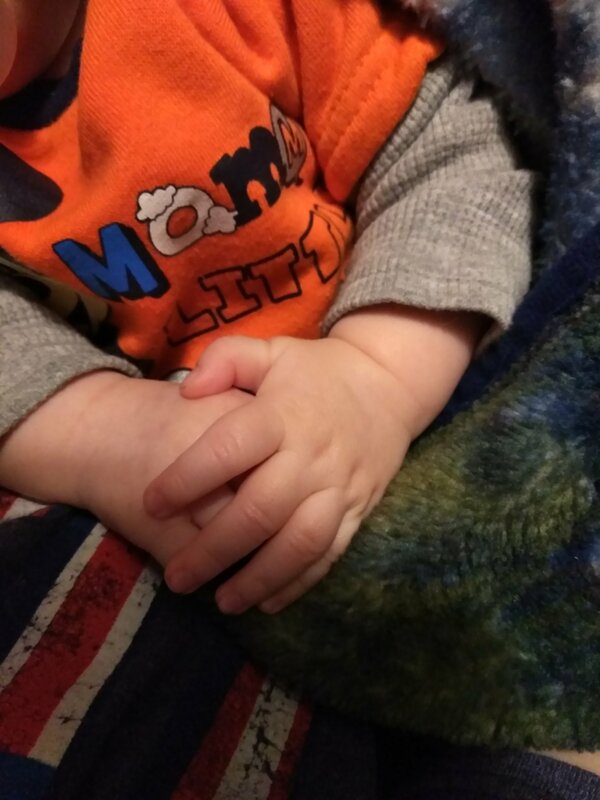 He chews on his blankets, hands and sleeves. 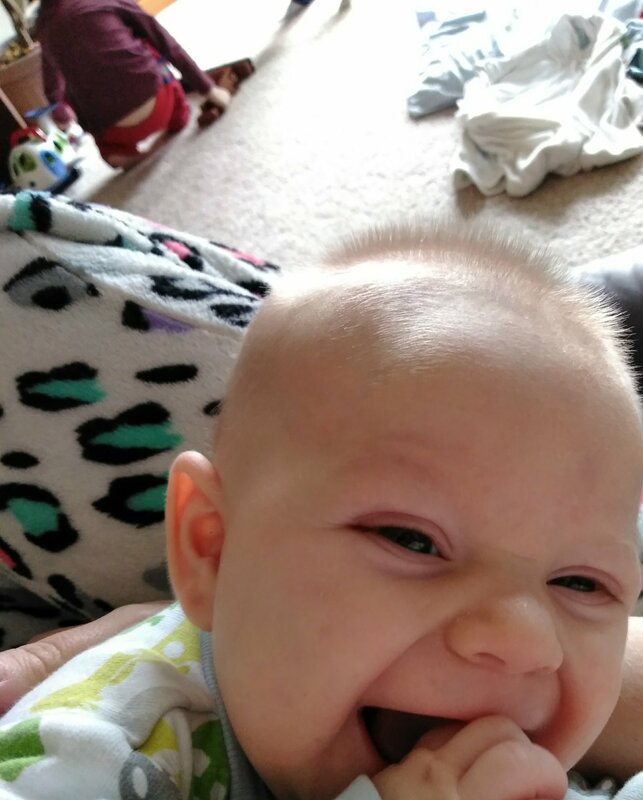 I think it will still be awhile before teeth appear but he’s certainly working on them! He isn’t a huge fan of being tickled. It makes him laugh as long as it is in very small doses but when he’s done, he’s done and any further tickles make him mad. I think the hair on the top of his head is approaching a half inch now and it sticks straight up and is the softest hair ever! I totally love it and I think it looks a bit darker than Tru and Levi’s was. Not sure yet. Dear God, thank You so much for this precious and adorable little boy. He truly is a Gracious Gift and I am so blessed to be his Mommy. Please heal him from whatever is causing this cough and congestion and help us all to get through this year healthy and strong. Thank You for all Your many blessings on us. In Jesus’ name, amen. 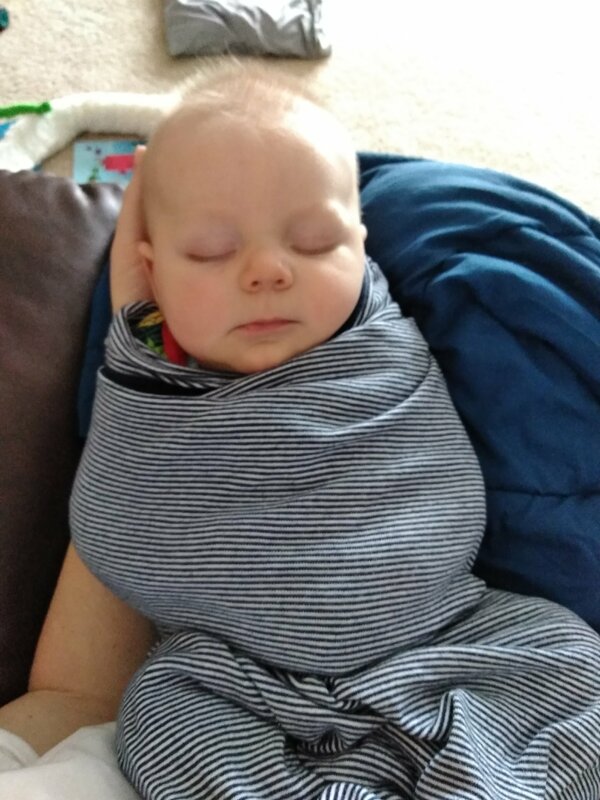 Where did my newborn go?!? It’s not him I regret, it’s his age. 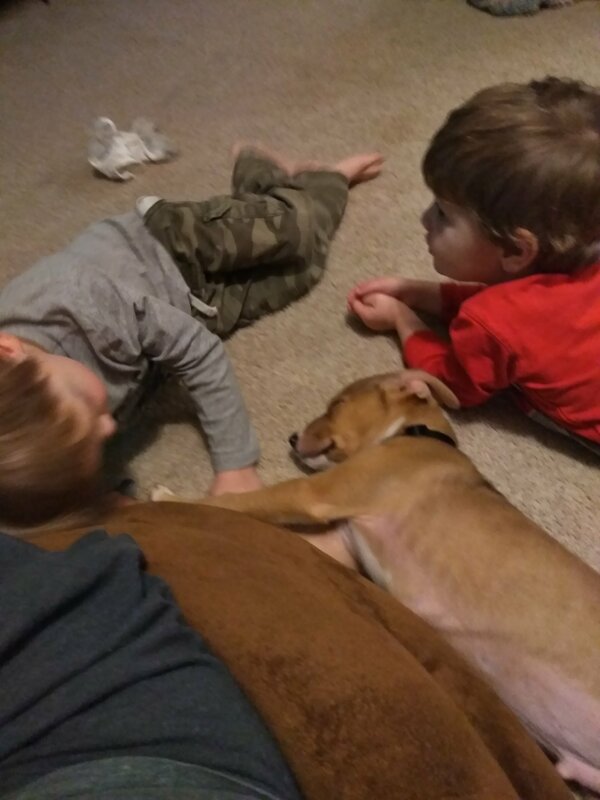 I know the puppy stage doesn’t last forever, but while I’m sitting here in a very exhausted state at 1am trying to keep him quiet so DH and the boys can sleep, I’m reminded of why we intended to get an adult, house trained dog. My baby sleeps through the night but the dog has me awake!! While I’m cleaning up the umpteenth puddle, I remember why we specifically wanted a house trained dog. I am having a hard time house training Rocky for all the many reasons that I’m sure you can already imagine for yourself. We are trying but I’m not sure we are making much progress. My beagle, River, trained easily and I guess I was quite lucky for that! Once he was trained, I could trust him to go months at a time with no messes. Hopefully we get there with Rocky eventually. I’m certainly taking him out more than enough but he’s not making the connection and it’s impossible to keep my eyes on him at all times while he’s indoors…. Yes, get a dog. A nice house trained, tired, old dog. But cover your eyes and walk away from the adorable puppies as fast as your legs can carry you. You’ll thank me later. But I mean, this is really seriously cute….